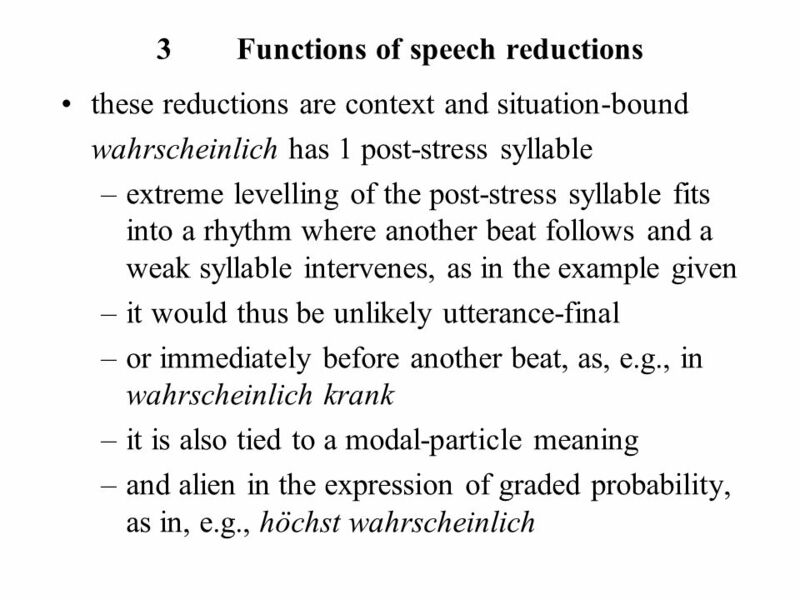 On the notion of 'fine phonetic detail' in communicative phonetic science The case of speech reduction Klaus J. Kohler IPDS, Kiel Speech Reduction Workshop. 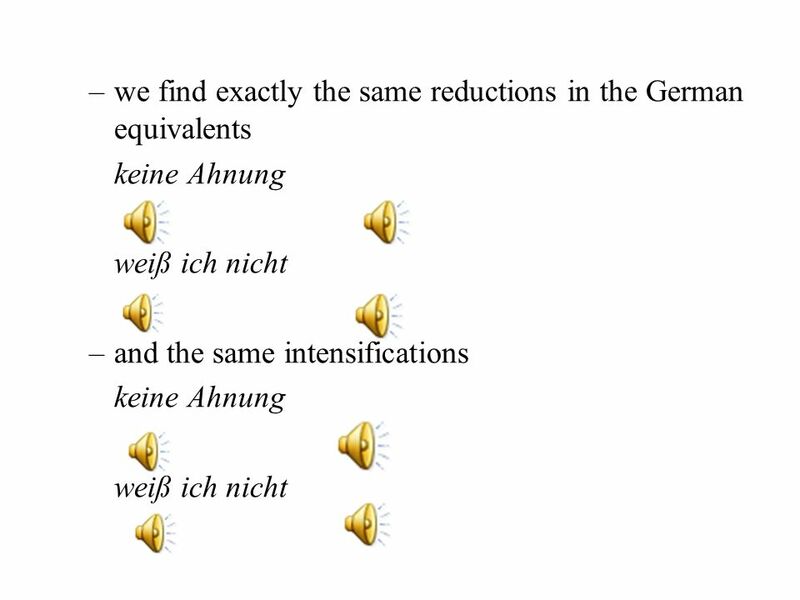 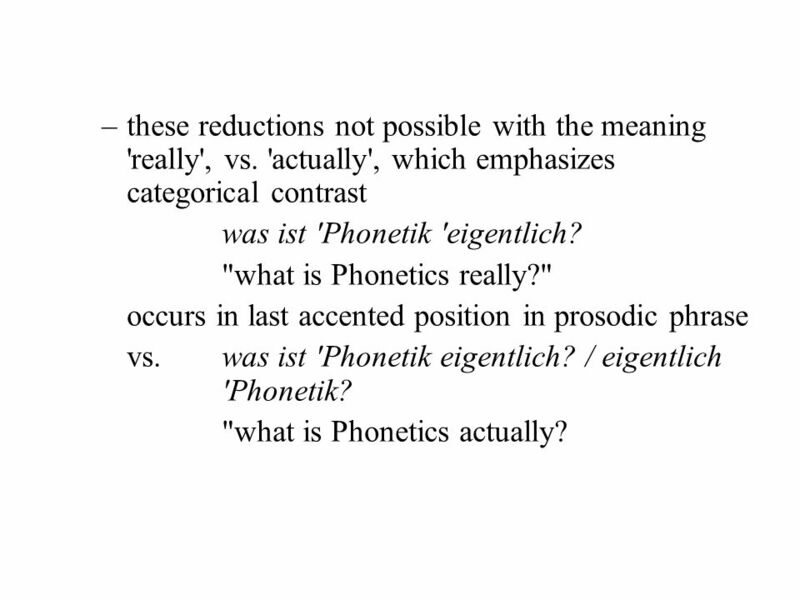 8 German wahrscheinlich ein bisschen "probably a little"
32 –these reductions not possible with the meaning 'really', vs. 'actually', which emphasizes categorical contrast was ist 'Phonetik 'eigentlich? 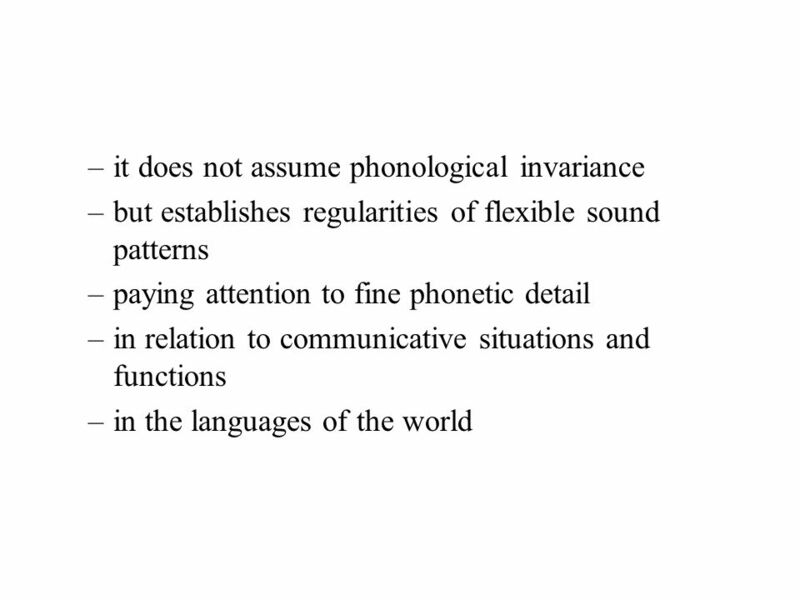 "what is Phonetics really?" 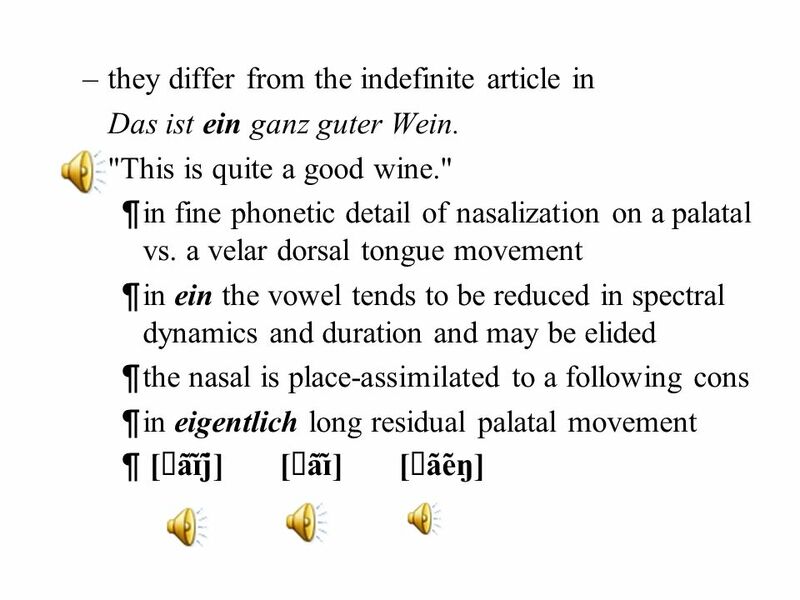 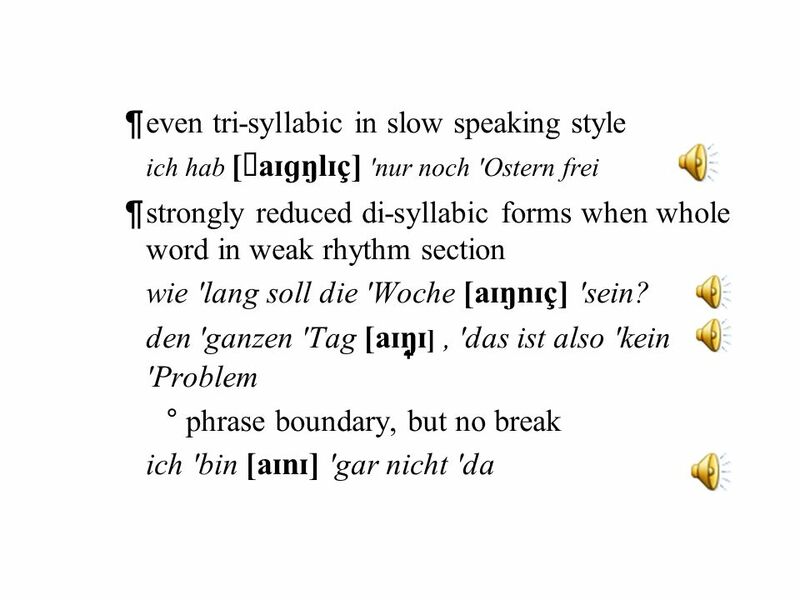 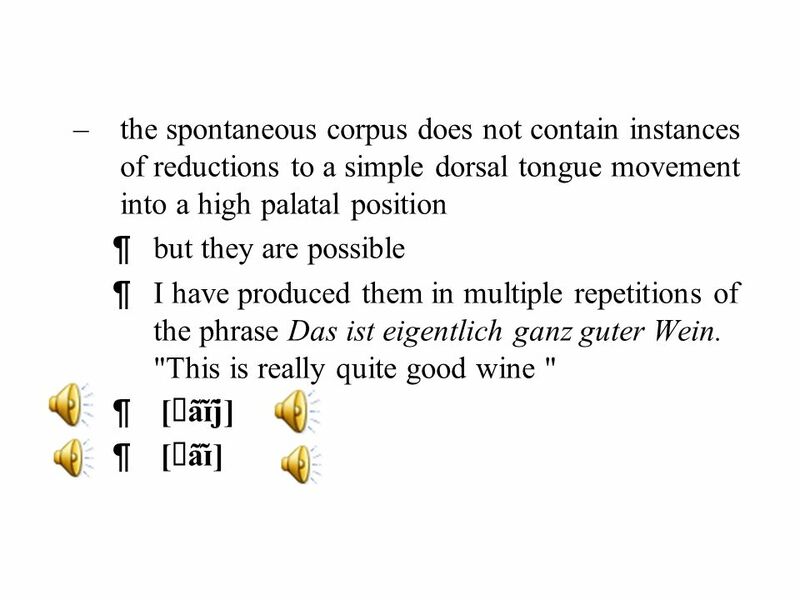 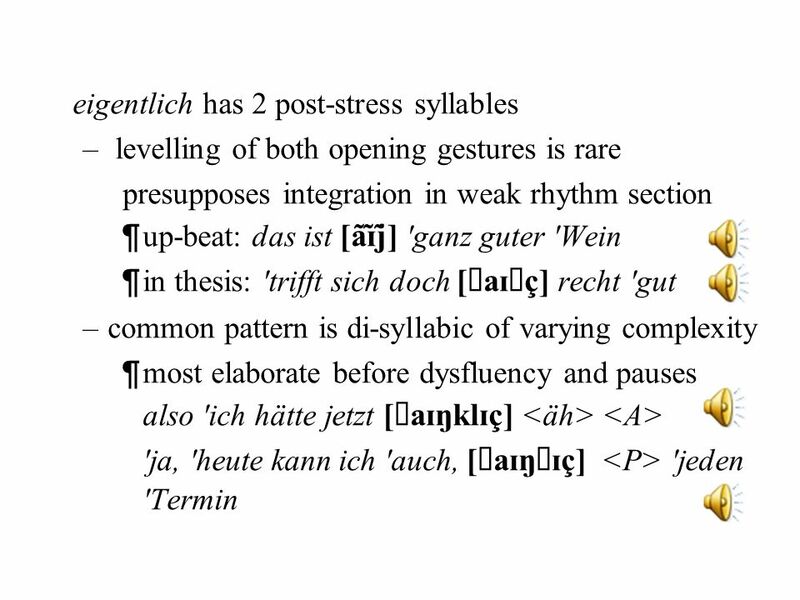 occurs in last accented position in prosodic phrase vs.was ist 'Phonetik eigentlich? 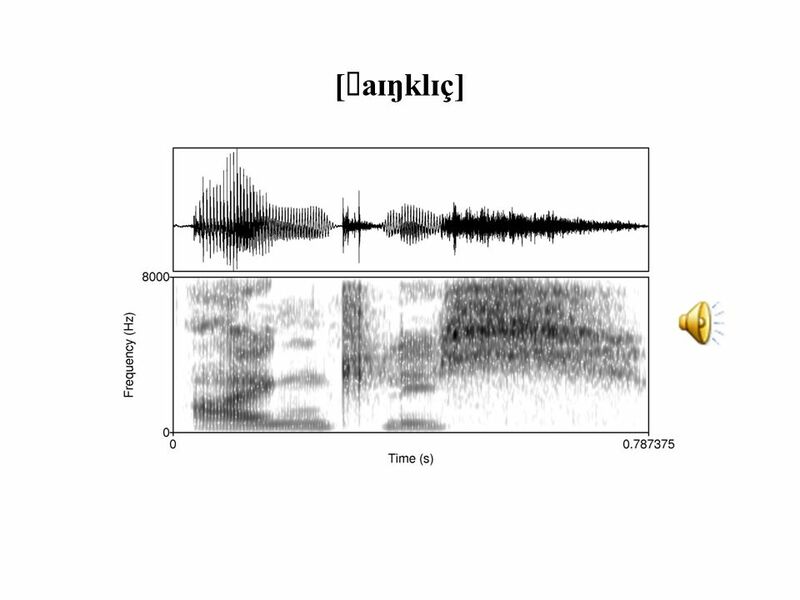 / eigentlich 'Phonetik? 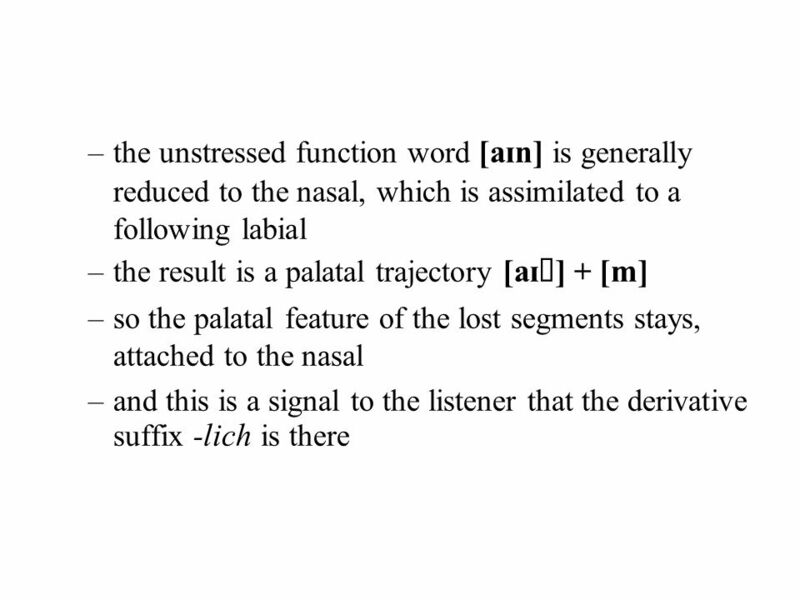 "what is Phonetics actually? 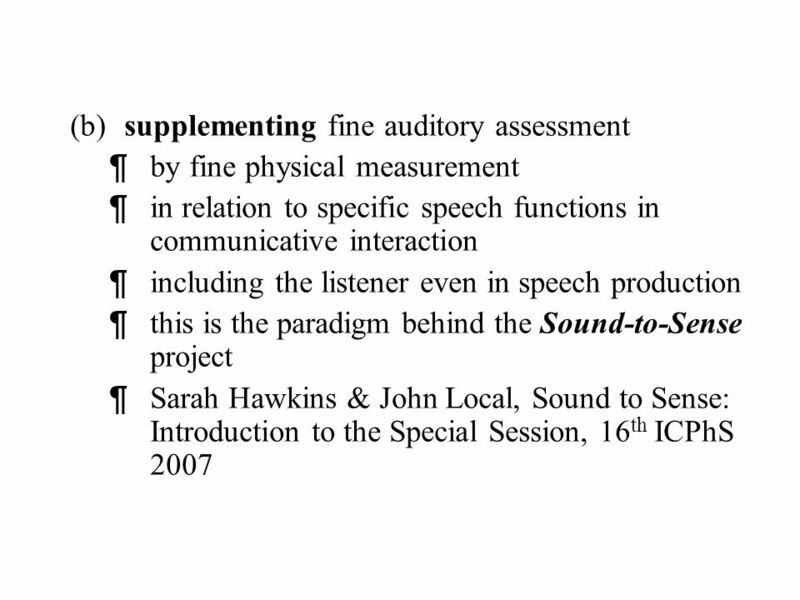 41 So, let me finish with a quotation from Stephen Handel, Listening. 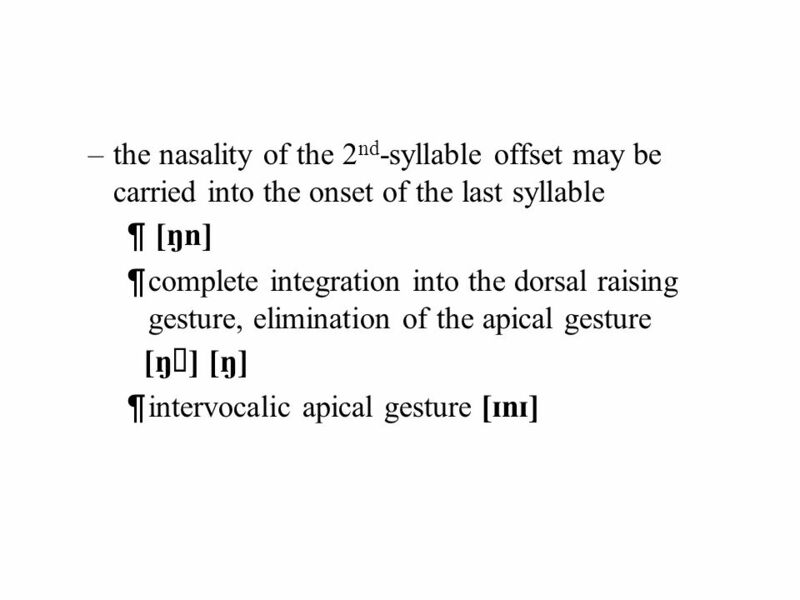 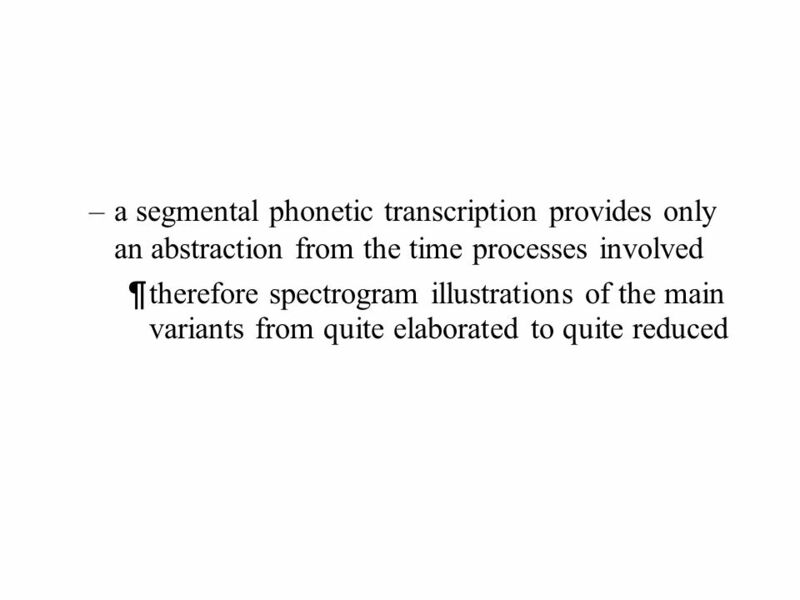 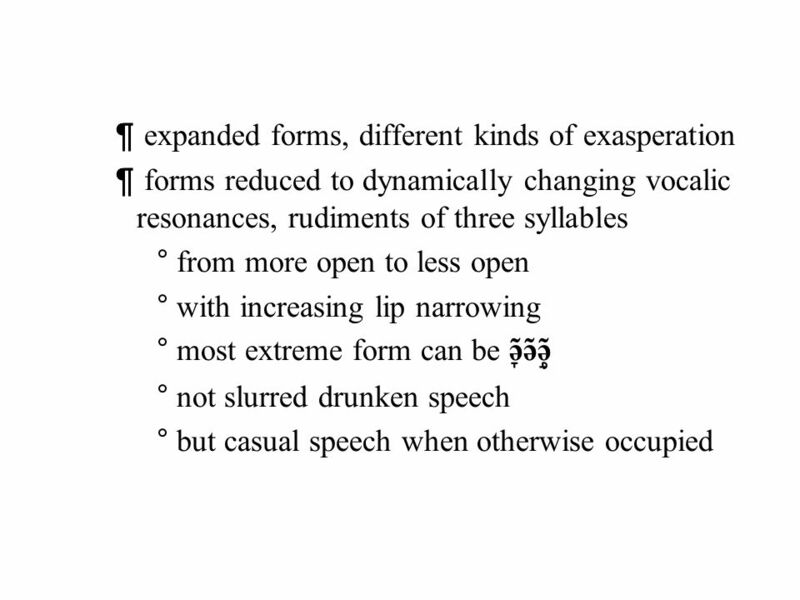 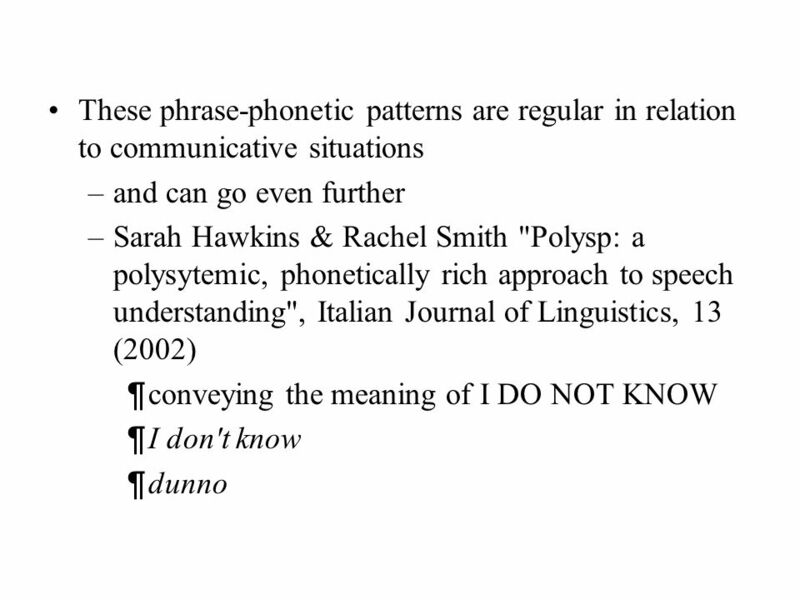 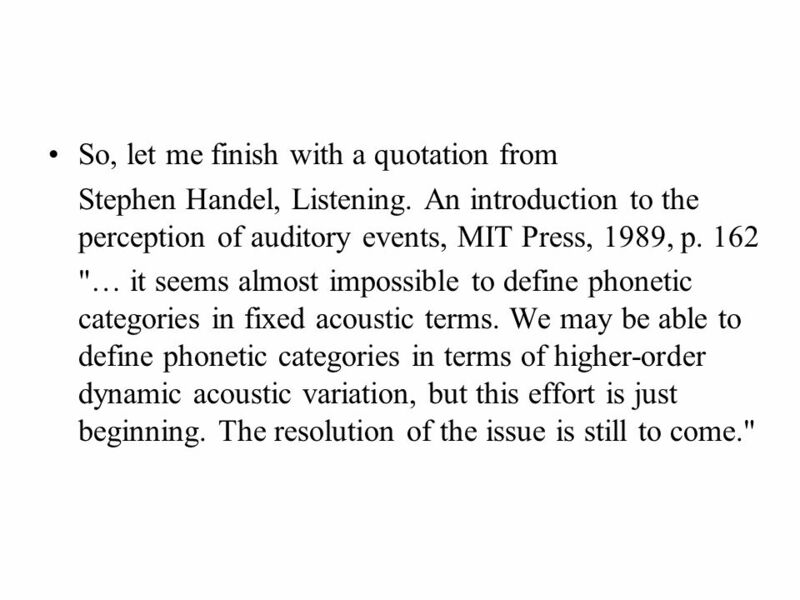 An introduction to the perception of auditory events, MIT Press, 1989, p. 162 "… it seems almost impossible to define phonetic categories in fixed acoustic terms. 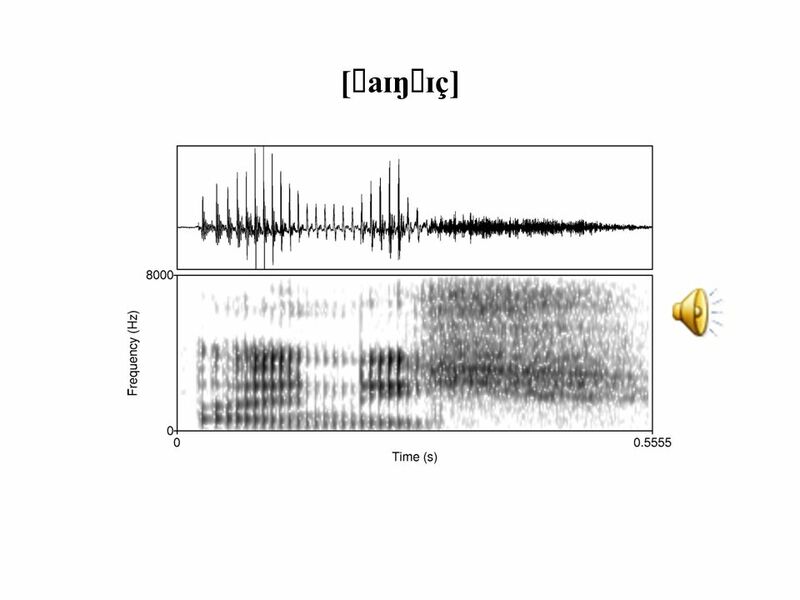 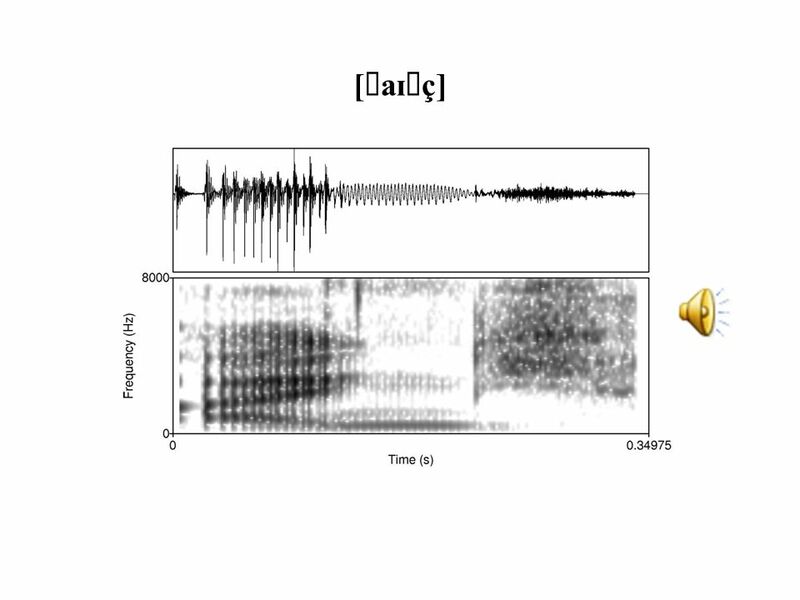 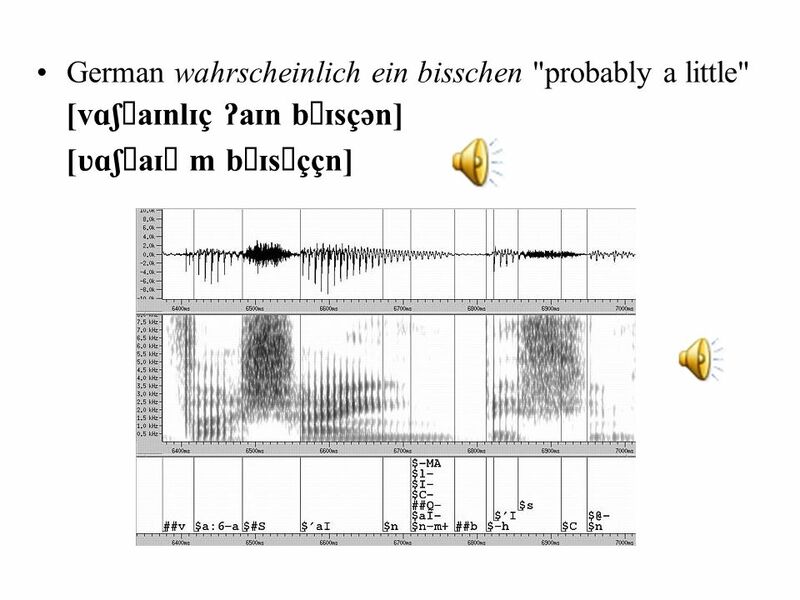 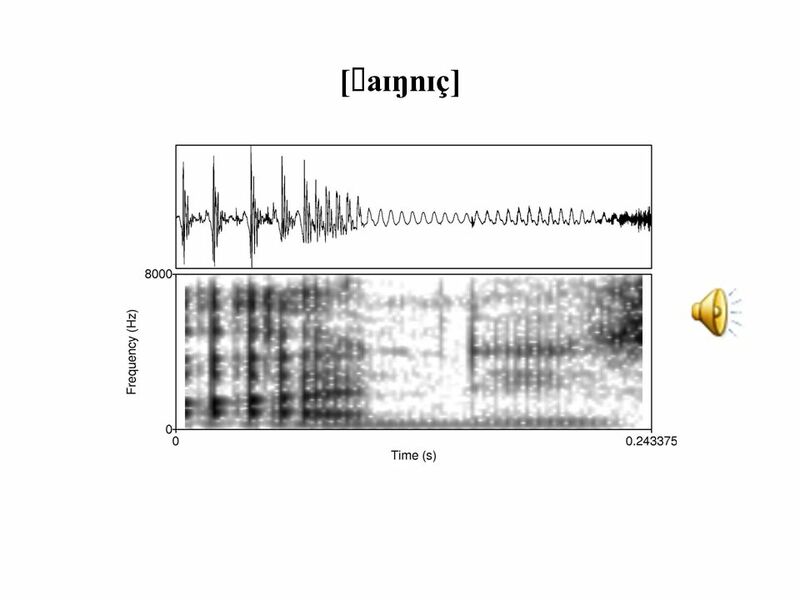 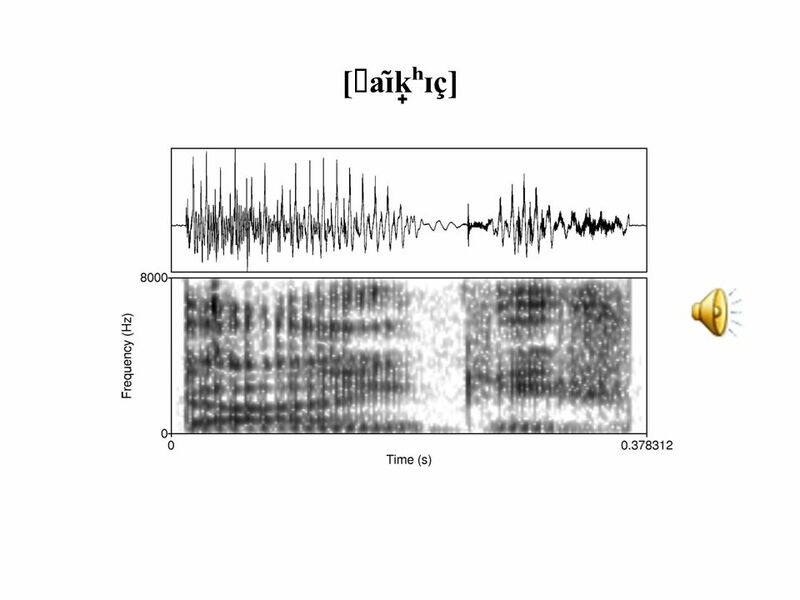 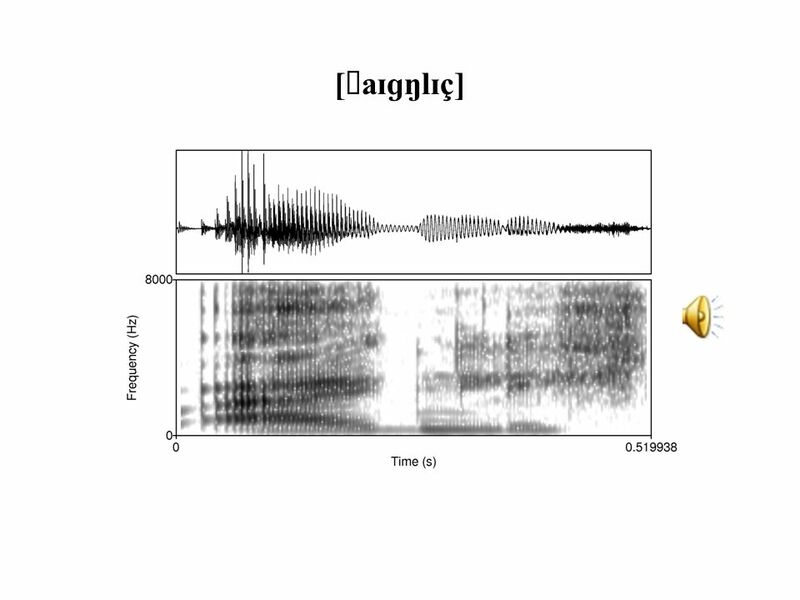 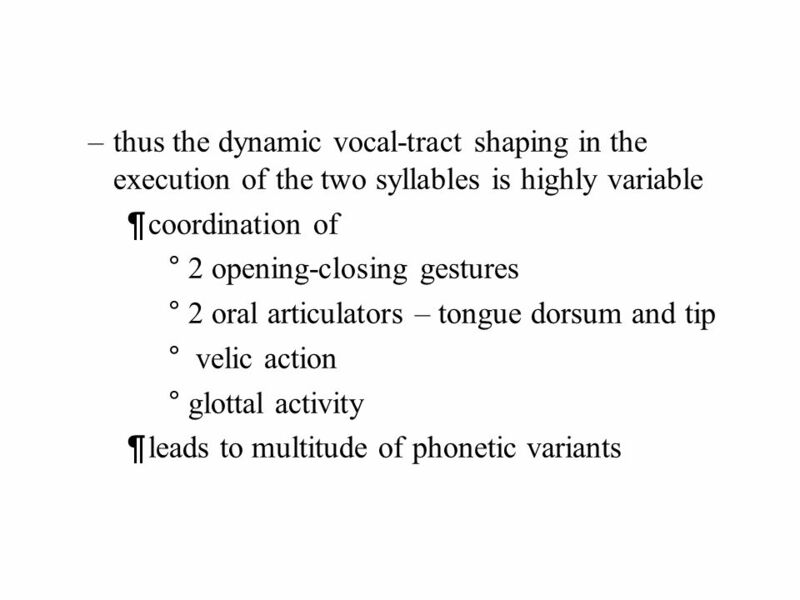 We may be able to define phonetic categories in terms of higher-order dynamic acoustic variation, but this effort is just beginning. 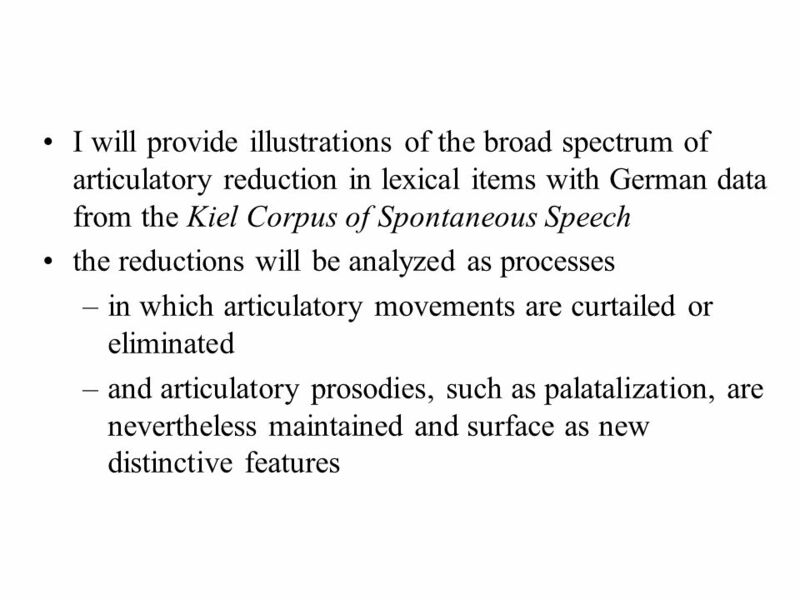 The resolution of the issue is still to come." 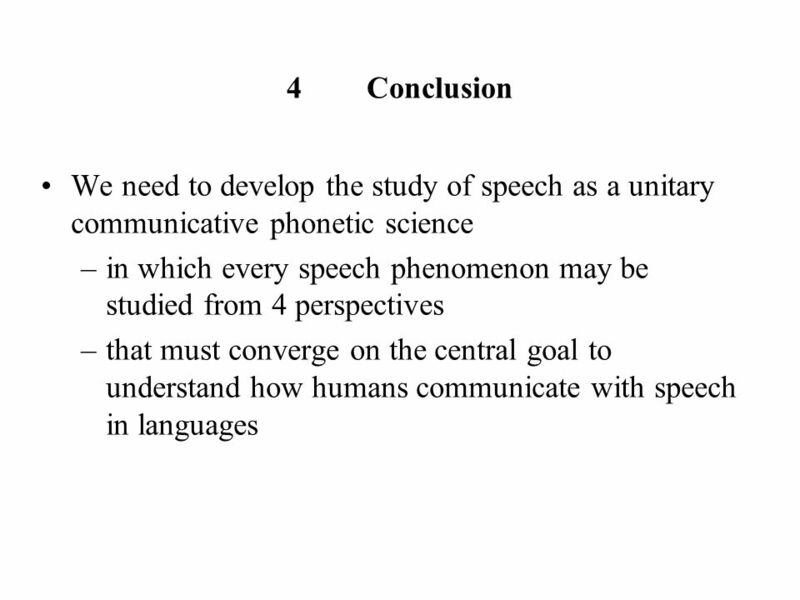 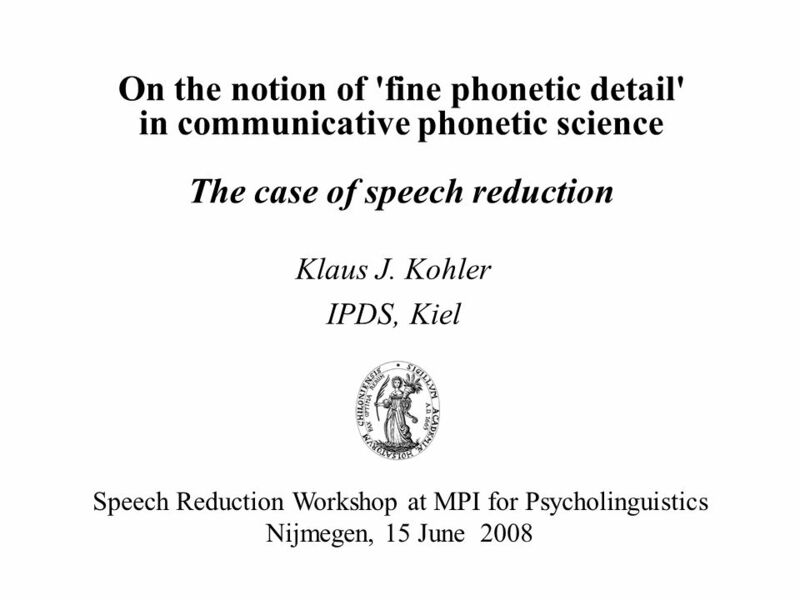 Download ppt "On the notion of 'fine phonetic detail' in communicative phonetic science The case of speech reduction Klaus J. Kohler IPDS, Kiel Speech Reduction Workshop." 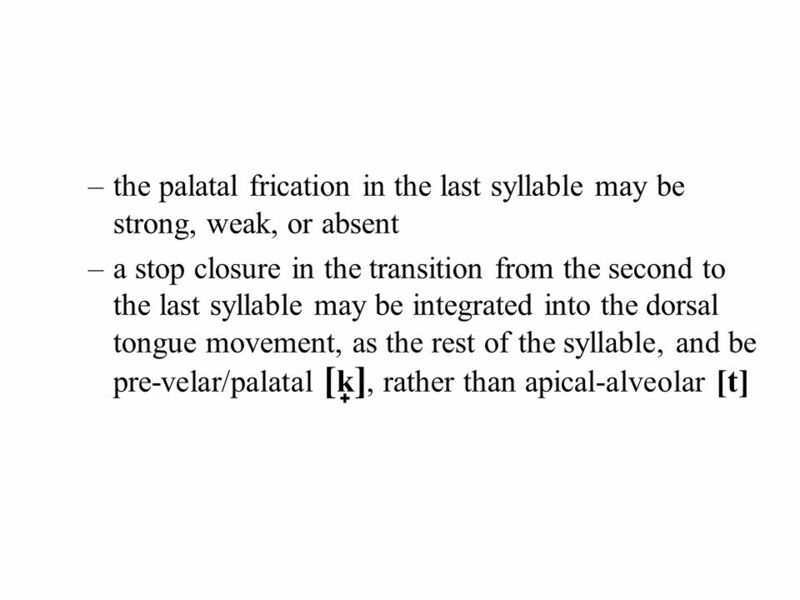 Normal Aspects of Articulation. 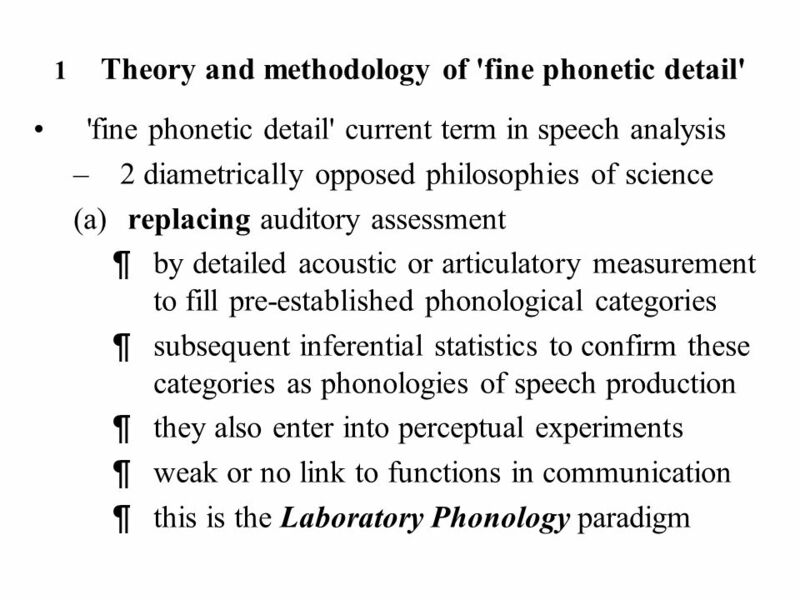 Definitions Phonetics Phonology Articulatory phonetics Acoustic phonetics Speech perception Phonemic transcription Phonetic. 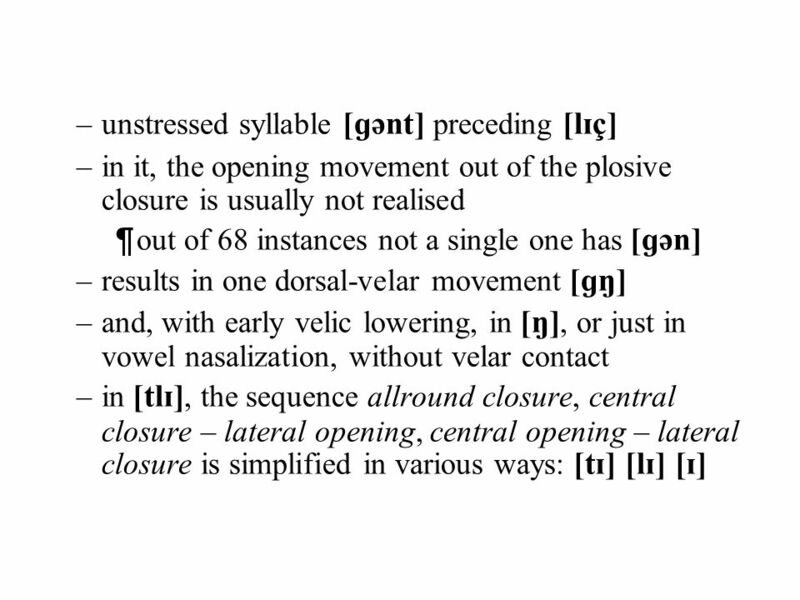 Sounds that “move” Diphthongs, glides and liquids. 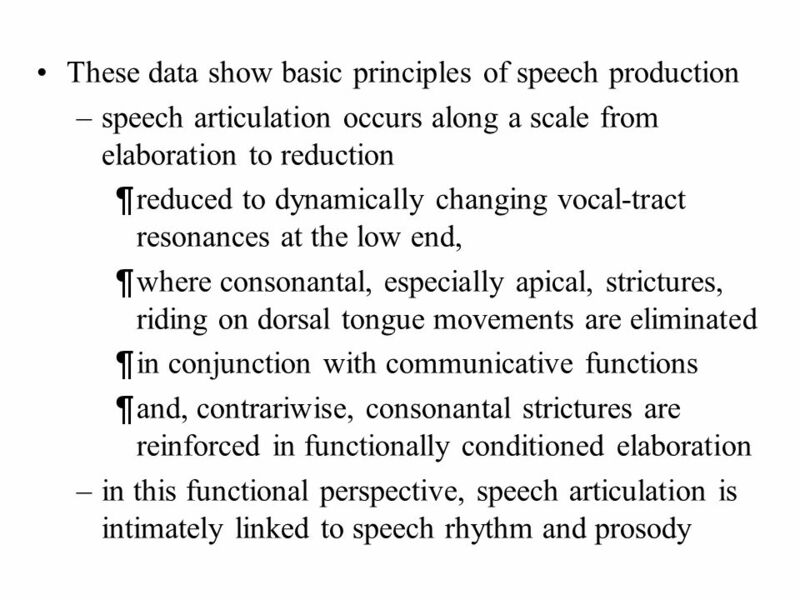 SPPA 403 Speech Science1 Unit 3 outline The Vocal Tract (VT) Source-Filter Theory of Speech Production Capturing Speech Dynamics The Vowels The Diphthongs. 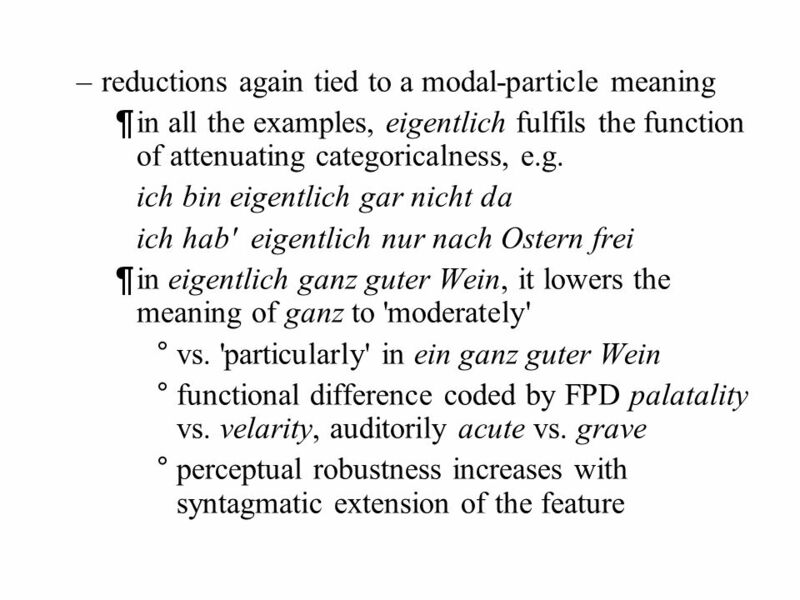 Plasticity, exemplars, and the perceptual equivalence of ‘defective’ and non-defective /r/ realisations Rachael-Anne Knight & Mark J. Jones. 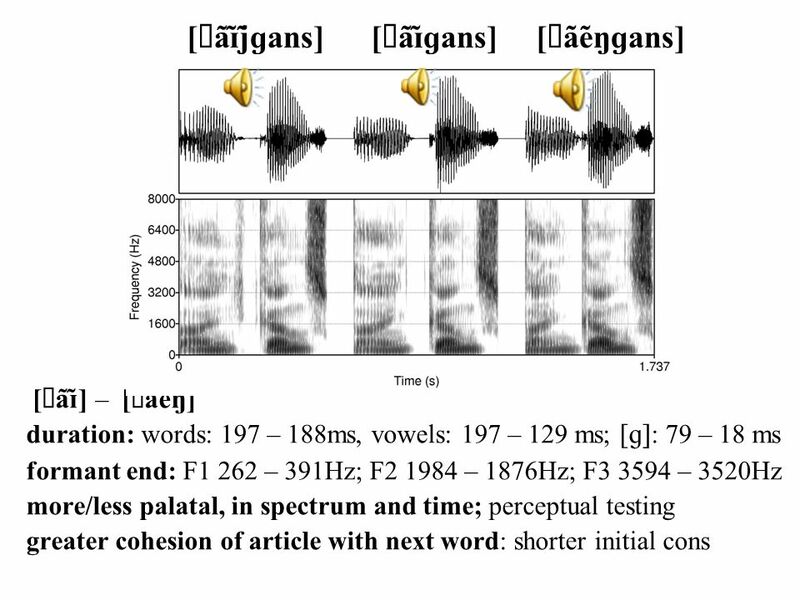 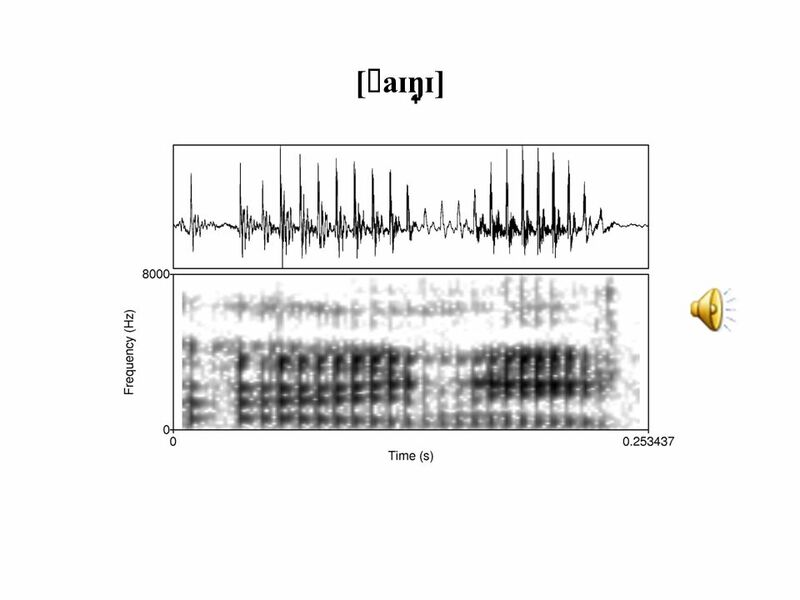 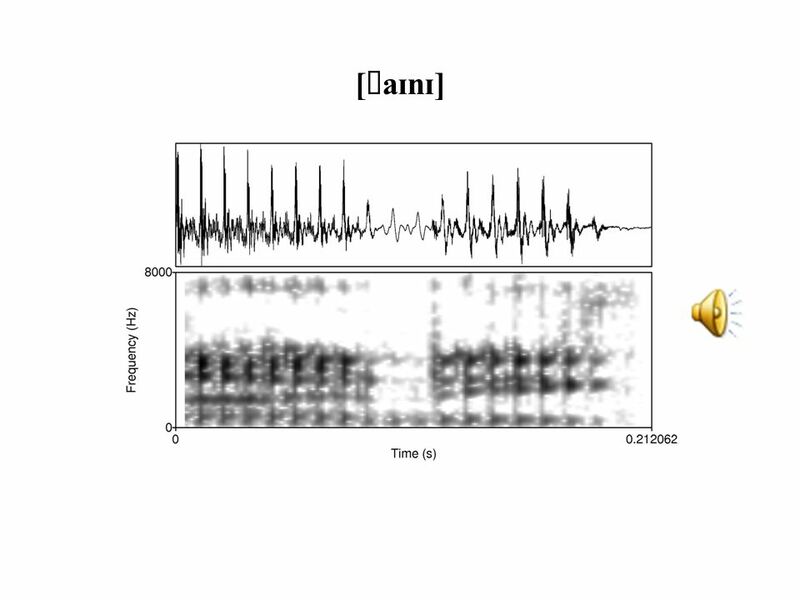 1 CS 551/651: Structure of Spoken Language Spectrogram Reading: Stops John-Paul Hosom Fall 2010. 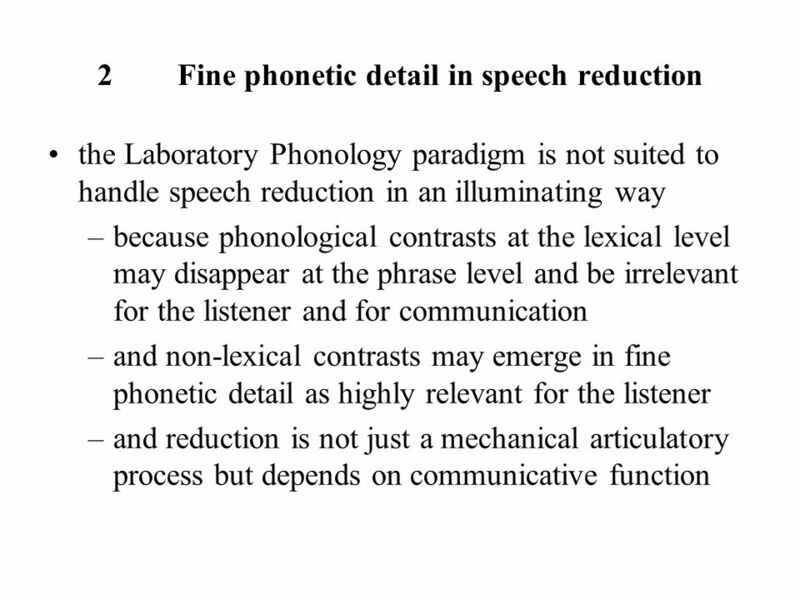 Spoken Language Analysis Dept. 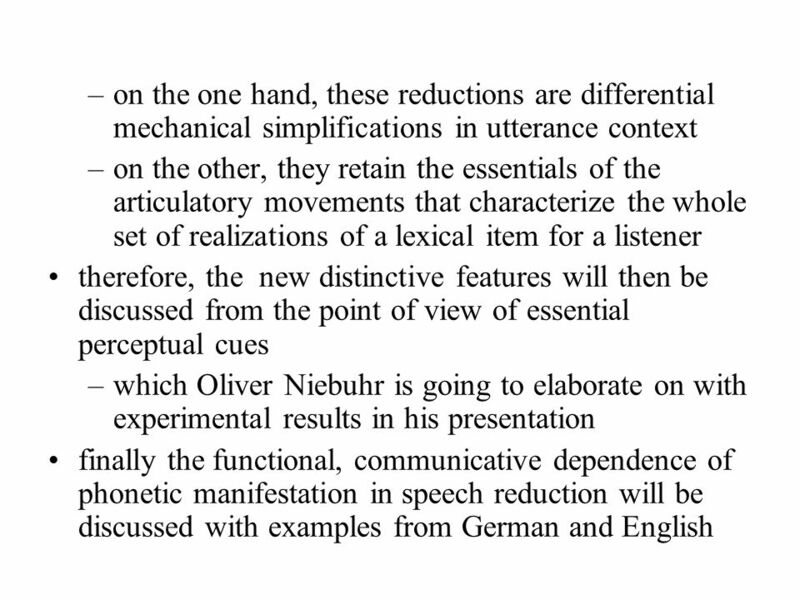 of General & Comparative Linguistics Christian-Albrechts-Universität zu Kiel Oliver Niebuhr 1 At the Segment-Prosody. 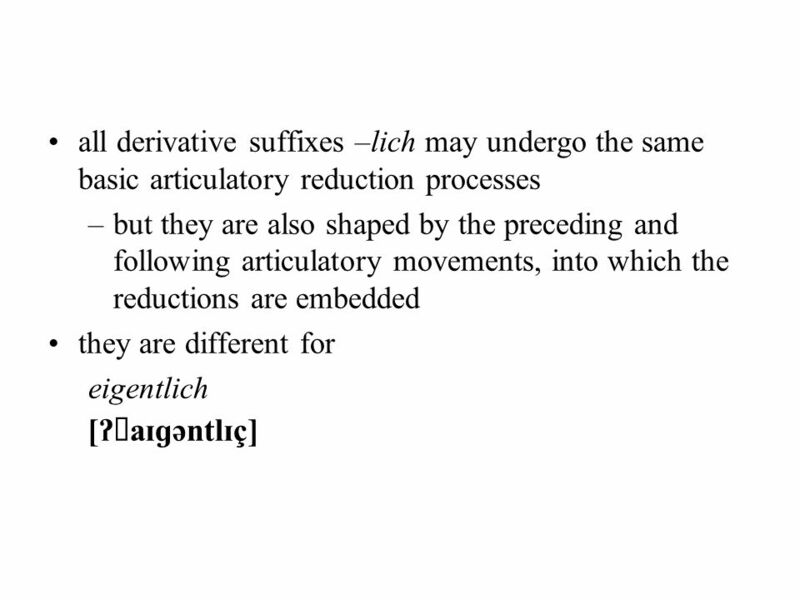 Niebuhr, D‘Imperio, Gili Fivela, Cangemi 1 Are there “Shapers” and “Aligners” ? 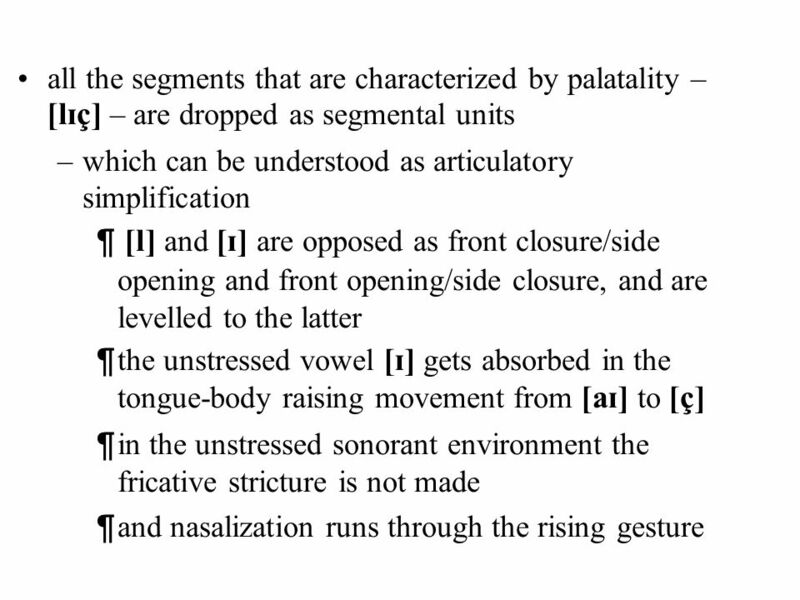 Individual differences in signalling pitch accent category. 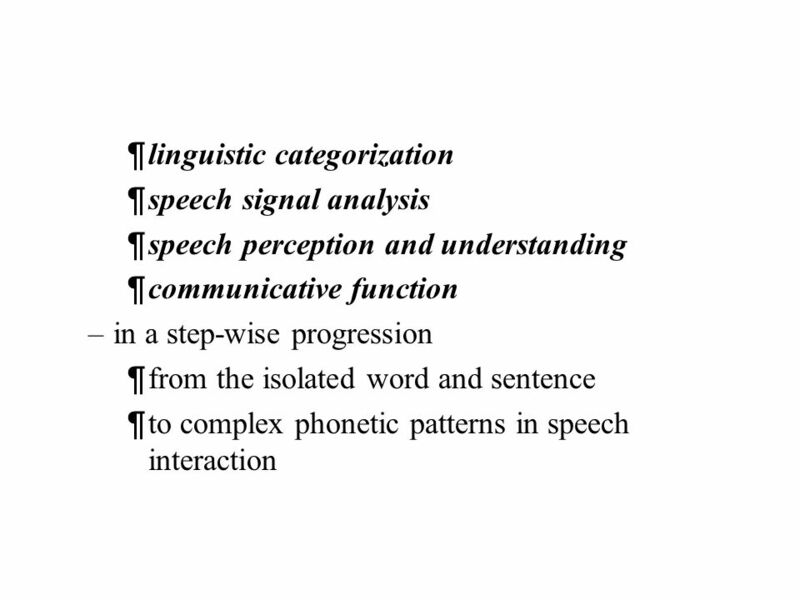 Phonology Phonology is essentially the description of the systems and patterns of speech sounds in a language. 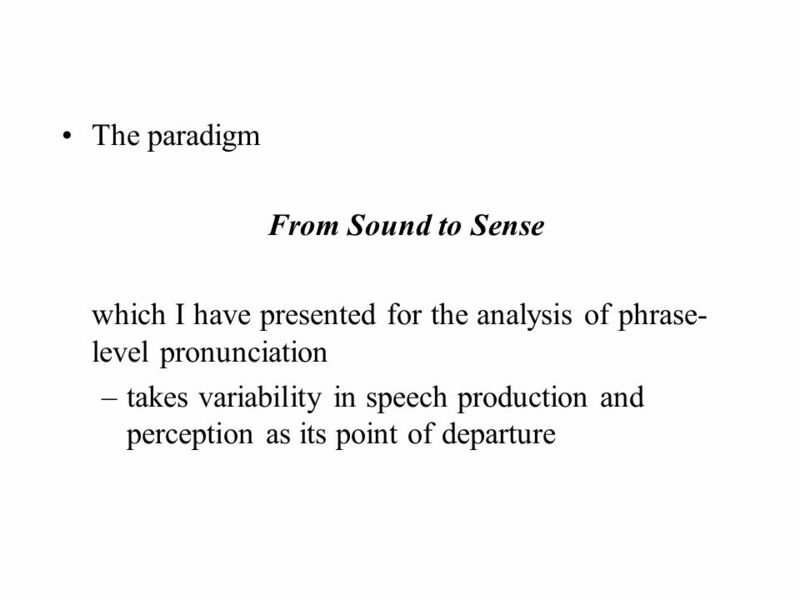 It is, in effect, based on a theory of.